This car is one of only two CCX Editions built. It is a U.S.-spec car, but has never actually been into the United States. This car made its debut at the Johannesburg International Motor Show in late 2008. It spent part of 2009 at dealer Autostrada Sport in Germany. It was finally offered for sale in the U.S. through Motorcars of Georgia in Autumn 2009, though the car remained in Europe. Soon after it was seized for issues with transport taxes. It made its way back to the factory in early 2011. It continues to make apearance throughout Europe, most notably in Monaco in 2012, and at the Gran Turismo Expos in both Stockholm and Gothenburg in late 2013. Currently the car is offered as a Koenigsegg Factory Certified Pre-Owned car, showing 7000km on the odometer. It is still eligible for legal import into and registration within the United States. Full Edition package featuring clear coated carbon fiber bodywork and Edtion-specific rear wing. The model call-out panels on the side show merely the Koenigsegg crest, a feature unique to Edition models. This car rides on the eleven-spoke, silver clearcoated wheels. As a U.S.-spec car it carries the red rear side marker lights. Full Edition-spec interior, featuring predominantly black leather and alcantara, and contrasting red leather seats and door inserts. Red "Koenigsegg Edition" labelling on passenger dashboard. Aluminum center console section, with a traditional manual transmission. 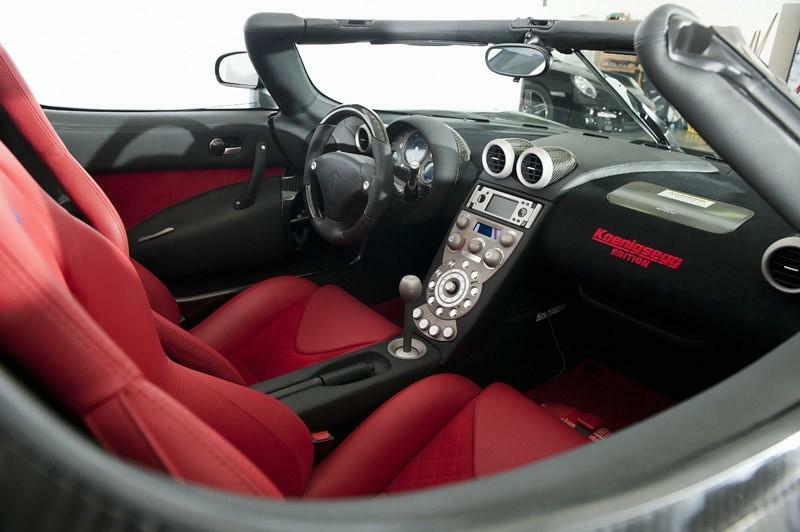 This car features a U.S.-spec passenger airbag. All Edition models have a 4.8 liter version of the CCX-series bespoke twin-supercharged Koenigsegg engine. The larger displacement was achieved through an increase in cylinder bore. Car #058 is one of two CCX Editions ever made and is therefore NOT biofuel capable. The 4.8 liter engine of the CCX Edition cars is rated at 888 horsepower on gasoline. The Koenigsegg engine easily meets U.S. EPA regulations and is OBD-II compliant.